Call today for your initial visit and see what Chiropractic can do for you! Walk-ins Always Welcome! 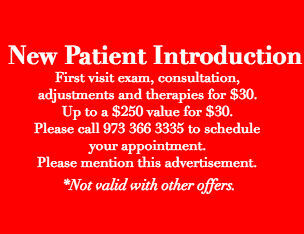 Call Today for your Initial Visit at 973-366-3335! Choosing the right Chiropractor is an important choice to make. Dr. Irhin and his staff are trained on the latest chiropractic treatments & technologies. If you are looking for a chiropractor in the Denville, Randolph, Dover, Mine Hill, Rockaway, Morris Plains, Parsippany and surrounding areas I welcome you to Commons Chiropractic Center, Michael A. Irhin, D.C.
All insurance Plans Accepted. If you are uninsured very fair and economical fees. When you have needs for chiropractic care, you need to turn to a chiropractor who listens and responds and an experienced doctor of chiropractic who knows the field and can effectively diagnose and treat your needs. A friendly chiropractor who counsels you on the best ways to maintain and improve your health. Our doctor of chiropractic meets all these criteria. Plus, you benefit from a personal trained professional who gives you the individualized attention you deserve. Commons Chiropractic Center believes that informed patients are better prepared to make decisions regarding their health and well being. That is why we have included information on this website covering an array of topics associated with chiropractic care. At Commons Chiropractic Center, I strive to make my office as efficient and convenient as possible. Included in these web pages is information about myoffice, including maps, directions, hours, insurance policies and appointment scheduling. You can even email a request for an appointment with me by clicking here! Thank you for choosing Commons Chiropractic Center for your chiropractic health care needs. The goal of my office is to provide the highest quality chiropractic health care that fits your individual needs. Chiropractic is a natural, safe, effective hands-on approach to many of our body's ailments and aches. I will be happy to answer any questions concerning your health care, for I pride myself in having satisfied clients/patients. Thank you for visiting the website of Denville Chiropractor Dr. Michael A. Irhin and Commons Chiropractic Center - a professional Denville chiropractic clinic. In practice as well as online, Denville New Jersey 07834 chiropractor Dr. Irhin strives for excellence through superior patient treatment, education and satisfaction. Serving Denville, Randolph, Dover, Mine Hill, Rockaway, Morris Plains, Parsippany and surrounding areas. Regularly see Michael Irhin since 2009 he provides excellent treatment for someone who is into fitness training and heavily into golf, my body is always in peek condition and pain free to perform at the thing I love most. ...MoreRegularly see Michael Irhin since 2009 he provides excellent treatment for someone who is into fitness training and heavily into golf, my body is always in peek condition and pain free to perform at the thing I love most. I've gone to 2 other chiropratics, he is the best. easily schedule appointments. I have been going to Michael Irhin for many years. He has helped me with both specific injuries and for maintenance of my chiropractic health. ...MoreI have been going to Michael Irhin for many years. He has helped me with both specific injuries and for maintenance of my chiropractic health. I like his availability for appointments for new and existing patients. Heating pad and muscle stimulation treatment prior to adjustments helps to aid therapy for me. I highly recommend him to friends and family for good personal health. He is knowledgeable, professional, honest, trustworthy and personable.